The North American monarch butterfly population is in peril. Local conservation, such as building monarch waystations, can help protect and rebuild the monarch population. Monarch butterflies are known as milkweed butterflies due to their dependence on the milkweed plant. Photo credit: shutterstock.com. In the United States and Canada, monarch butterflies generally signal the end of spring and the beginning of summer. There are two populations of monarchs in North America divided by the Rocky Mountains. The smaller western monarch population summers in central British Columbia and migrates to overwinter in central California. The larger eastern North American monarch population summers in southern Canada and northern US before migrating in the fall to overwinter at the Mariposa Monarca Biosphere Reserve in Mexico. The reserve comprises 56,000 hectares, much of which is forests of pine, holm oak, and oyamel fir trees. From October to March, millions of butterflies cluster upon the trees, prompting the creation of the biosphere reserve in 1980 and its declaration as a UNESCO world heritage site in 2008. In recent years, however, monarch butterfly populations have been on the decline. Up to a billion monarch butterflies cluster in the forests of the Monarch Butterfly Biosphere Reserve in Mexico. Photo credit: shutterstock.com. The monarch butterfly population has declined by 80% over the past ten to twenty years. The historical average monarch population numbered 300 million individuals. The historical high is thought to be 1 billion individuals, and during the winter of 1996-1997 clusters of monarchs overwintering in Mexico covered 18 hectares. On average, monarchs overwintering in Mexico cover 6 hectares. Coverage decreased to just 0.67 hectares over the 2013-2014 winter before rebounding to just over 4 hectares over the 2015-2016 winter. The monarch is considered an endangered species by the Committee on the Status of Endangered Wildlife in Canada and is undergoing assessment for inclusion under the Endangered Species Act by the US Fish and Wildlife Service. A study prepared for the US Forestry Service listed the eastern monarch population as critically imperiled due to its rapid decline, whereas the western monarch population was categorized as vulnerable to imperiled. One study examining monarch populations claim that the species has a chance of going quasi-extinct over the next two decades. An approximate 5-fold increase in their population is necessary to halve this risk. Active conservation is thus required to impede threats to the monarch population and in the process, prevent the continued decline of their population. Climate change, habitat loss, use of herbicides and pesticides, and the loss of native plant species coupled with the of proliferation of invasive plant species have all contributed to the decline of North American monarch butterfly populations. Monarch butterflies depend exclusively on milkweed plants as breeding grounds and nurseries. The sizeable decline of milkweed throughout Canada and the United States is due to its misidentification as an agricultural pest as well as the increased usage of herbicides and pesticides in agricultural practices. In addition, invasive plants such as the black swallow-wort and pale swallow-wort, species of milkweed native to Europe which now grow throughout Canada and the US, aid in the declining populations. These species, which produce stimuli similar to native vining milkweed, entice breeding monarchs; however, the monarch caterpillars that survive on the vining milkweed for nourishment are poisoned by these highly toxic species. Climate change is also thought to have contributed to the decline in monarch populations. Temperature variations in spring and fall can be extremely problematic for developing larvae and migrating butterflies. Hotter temperatures cause eggs to dry out resulting in lowered hatch rates, while colder temperatures limit the monarch’s ability to fly. Abnormal conditions such as freezing temperatures or heavy rainfall can also impact milkweed growth resulting in loss of monarch breeding grounds. Freak storms linked to changing climatic conditions can also have devastating effects on monarch populations, with one such storm wiping out as many as 75% of the overwintering population in Mexico. Interestingly, population counts show a disconnect between the number of breeding pairs in Canada and the US and the number of overwintering butterflies in Mexico. Factors explaining this phenomenon could be losses during migrations due to storms caused by climatic changes in addition to increased mortality due to car strikes. Mexican scientists that have been monitoring monarch populations overwintering at the reserve have joined forces with Canadian and American scientists to better monitor the number of monarchs from the larval stage through their migration to the reserve in an effort to track migratory monarch populations. The egg and larval stages are exclusively depended on the milkweed species. Photo credit: shutterstock.com. The increasing threat to North American monarch populations has fueled conservations efforts across all three countries. World Atlas recently spoke to Jill Sturdy, the NatureHood Program Manager at Nature Canada about the importance of monarch butterfly conservation. One of the most important conservations efforts is in the reintroduction of native milkweed species in monarch breeding grounds. Monarch populations are dependent on milkweed plants for multiple reasons. The Trilateral Monarch Butterfly "Sister Protected Areas" (SPA) Network established monarch preserves across Canada, the United States, and Mexico. In February 2015, the US government further pledged $3.2 million in February 2015 to help the conservation of the monarch butterfly through land restoration and other conservation efforts. However, more needs to be done to ensure the survival of the monarch butterfly. Adult monarch butterflies rely on the nectar of native wildflowers. Photo credit: shutterstock.com. The monarch is known as the “milkweed butterfly” because of their dependence on milkweed plants, but monarch butterflies don’t only require milkweed to survive. While milkweed is important as a breeding habitat as milkweed is the only food source of monarch larvae, as adults they depend on nectar from wildflowers as a food source. Monarch waystations provide the butterflies with the plants they need to reproduce and sustain their migration from their breeding grounds in Canada and the US to their overwinter habitats in California and Mexico. There are several varieties of milkweed that are native to Canada, such as the Common milkweed (Asclepias syriaca), Swamp milkweed (Asclepias incarnata), Butterfly milkweed (Asclepias tuberosa), and Poke milkweed (Asclepias exaltata). Make sure to pick milkweed varieties native to your area. Adult monarchs are much less picky. Although they generally prefer pink, orange, purple, and yellow flowers, most fragrant, nectar-rich flowers will do. 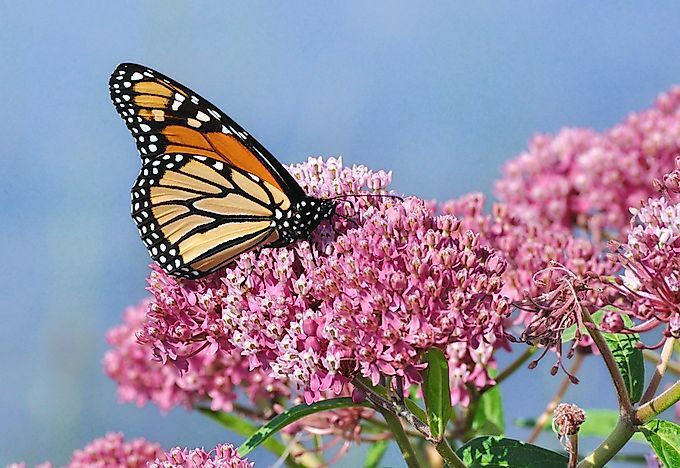 Make sure to pick flowers that bloom at different times during the summer as well as into the fall to provide monarchs with fuel for their migration. Goldenrods, asters, sunflowers, and daisies are some native wildflowers that monarch butterflies prefer. The location of your garden is also important. As adults, monarch butterflies are most active during midday, so flowers should be planted in locations where they will receive sunlight for most of the day. Flat stones will also provide monarchs a place to bask in the sun. In addition, the garden should be semi-sheltered to provide protection from the wind and possible predators. The most important part of building a monarch-friendly garden is to not use any pesticides or herbicides that will kill monarch larvae and butterflies. Kelly Bergevin is a writer and editor based in Montreal, Canada. She has a background in education, history, and English. She is an avid reader, coffee-drinker, and learner, and has recently turned her focus towards environmental issues and wildlife conservation efforts.